The cloud has finally descended upon Apple’s networking hardware, as the company on Monday released updates for its AirPort Extreme, AirPort Express, and Time Capsule base stations, along with a new version of its AirPort Utility network software. Chief among the improvements in AirPort firmware update 7.6.1 is the capability to remotely access a Time Capsule’s hard drive or a hard drive connected to an AirPort device via USB. This feature previously operated via the Back to My Mac feature of Apple’s MobileMe online service, but it became unusable once MobileMe users transitioned their accounts to iCloud; the new update relies instead on the latest incarnation of Apple’s online service. There’s also an additional fix for wireless performance, and security improvements. 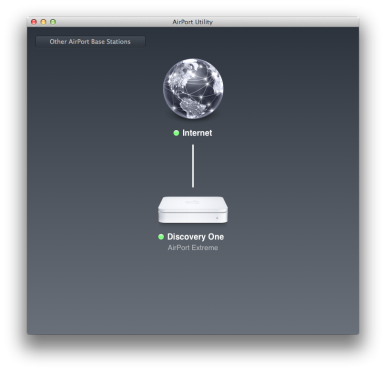 The update applies to all 802.11n AirPort base stations and Time Capsules, and Apple recommends installing AirPort Utility 5.5.3 or later before installing the firmware update. Speaking of AirPort Utility, the software you use to manage your wireless network on your Mac gets an overhaul in two separate versions: 6.0 applies to 802.11n base stations, while version 5.6 is targeted at older 802.11g versions of the AirPort Express and AirPort Extreme. The latter also fixes a problem with using networked passwords stored in the Keychain. Version 6.0 is the more impressive of the two, featuring a graphical user interface that looks almost identical to the AirPort Utility for iOS app that Apple released last year. While it still maintains most of the features of the previous iteration, the graphical user interface makes the system somewhat friendlier and easier to use. Some of the more advanced features of the software, however, have been left behind, but those who need those capabilities can install both version 5.6 and 6.0 on the same computer and use them independently. Note, though, that both versions 5.6 and 6.0 require Lion, so users of Snow Leopard and earlier are out of luck. All of the updates are free and available both via Software Update and Apple’s support downloads site. Updated 10:47p.m. PT to clarify features removed in the newer version, and to specify Lion compatibility.